Data science shows climate change is causing extreme weather conditions, which are a wake-up call for humanity to come up with new ways to live. Nearly 200 countries, including the U.S., China, Europe and India, have pledged to reduce their pollution, strengthen their climate commitments every five years, protect people living on the frontlines of climate impacts and help developing nations expand their clean energy economies. Most importantly, this agreement sets ambitious goals. It calls for holding global temperature increases to 1.5 degrees Celsius, with a first step of keeping us below 2 degrees of warming. A crisis that took centuries to get here won't go away, but it has met its match in the collective will of a united world. In December 2015, world leaders gathered in Paris with a mission as simple as it was daunting: Save the planet before it’s too late. After two weeks of discussion and negotiation, they signed an historic agreement to reduce the dangerous carbon pollution that's driving global climate change. With nearly 200 countries committed to climate action—along with cities, businesses, innovators and investors—the goal is to speed the shift away from dirty fossil fuels and toward cleaner, smarter energy. For the U.S., the commitment to act on climate is embodied by the Clean Power Plan, the historic plan announced this summer to reduce carbon pollution from America’s coal-fired power plants. Mayors and governors described what they are already doing to reduce carbon pollution and how they plan to do more. Multinational corporations said they are cutting carbon pollution across their operations. Financial institutions reported that renewable energy is a better investment than fossil fuels. Leaders from developing nations explained that clean energy is helping to generate economic growth and bring people out of poverty. And thousands of people from all over the world stood up for climate action. This groundswell has the backs of national leaders in implementing ambitious climate policies. Flora and fauna are affected and seasons are less predictable. Farmers complain that it does not rain as much anymore. They say that the seasons are less predictable. Summer can begin early, and winter often comes late. Besides, it is often unseasonably warm or cold. Both crops and livestock are affected, as are the flora and fauna. Farmers talk about how agriculture has become trickier because of increasingly erratic weather. Older people say that India’s climate has changed dramatically during their lifetime. Tornadoes, heavy rains and floods in most parts of the world dominate news headlines. This past week, extreme weather conditions dominated news headlines. In the U.S., at least 25 died after tornadoes and heavy rains lashed several states. Even as the dead were still being counted, a new storm hit Texas. In South America, vast areas in Paraguay, Uruguay, Argentina and Brazil are suffering the worst flooding in 50 years. Consequently, more than 150,000 people have been evacuated. Even the green and blessed isle of England is experiencing “unprecedented” flooding in Yorkshire and Lancashire. With rivers overflowing their banks in northern England, a relatively temperate place is facing the wrath of the weather gods, too. 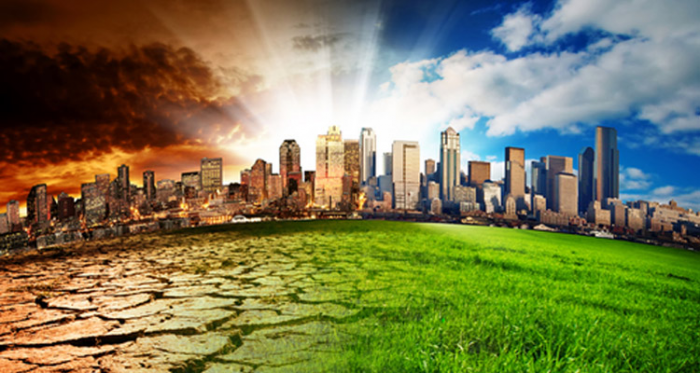 What is lacking is an informed debate on the pressures facing the land – increasing demand for food, energy, water and housing – when we should be adapting to and mitigating the impact of climate change. But that means planning ahead, prioritising resources and, yes, borrowing as a nation to invest in and safeguard our future – unlikely at a time when the very concept of planning, still less long-term investment, has become a pejorative term. How can greenhouse gas emissions reduce if the world's human population (consumers) continues to grow by 1% per year? At this rate, exponential growth will double the world population in just 60 years, from 7.3 billion to 14.6 billion! Family size needs to average 2.1 worldwide to achieve ZPG, and developed countries need to reduce their natural resource per capita consumption rates to help combat climate change. This word supposedly captures collapse of public institutions, the death of rivers, the damage to people’s health and anything else. It's imperative to understand the data and find practical solutions to inherited problems. If everyone on the planet considered the body of climate change data and took the problem seriously, it would be solved by now. The technologies exist and can be deployed within a couple of years. It is a question of priorities, which is an alias for money, or resources if you prefer. It’s imperative to continue organising and finding practical solutions to the problems we have inherited. The truth is that with over seven billion people on the planet, unfettered consumption is criminal. Extreme weather conditions are a wake-up call for humanity to come up with new ways to live. Forests and rivers matter, as do social cohesion and personal fulfilment. Other species have the right to survive and live on the planet as human beings do. Life is more than stuff, and humanity has to think beyond markets. A crisis that took centuries to get here won't go away, but it has met its match in the collective will of a united world. This work won't be easy. The Paris agreement— and an obligation to future generations—demands that nations transform how they think about electricity, transportation, industry, methane from fracking, HFCs from air conditioning, agriculture and other contributors to climate change. It also requires helping developing countries face the challenges of poverty alleviation, energy equity and climate justice. Here in the U.S., it entails going up against entrenched fossil fuel interests and those politicians who persist in denying climate change. Climate change is our problem. Together, we can solve it. These are significant hurdles, but citizens, businesses and political leaders around the globe have made it clear that they support strong climate action. This momentum will carry forward. And the Paris climate agreement and action agenda will provide the road map.